Italy's prime minister has said Europe needs a central power authority to prevent the kind of blackouts that left swathes of West Europe without energy. An overload in Germany's power network triggered outages leaving millions without electricity on Saturday night. Romano Prodi said there was a "contradiction" in having a unified power network but no central authority. Power failed first in Cologne, Germany, before shutting down across parts of France, Italy, Spain and Austria. Belgium, the Netherlands and Croatia were also affected. "My first impression is that there is a contradiction between having European networks but not having a central European authority. It is somewhat absurd," Mr Prodi said. German utility provider E.ON said early investigations suggested the supply failures were caused by overloads in the power network in northwest of the country, according to Reuters. In Spain, power was lost in the cities of Madrid, Barcelona, Zaragoza and parts of the Andalucia region. E.ON said the power failures may have been linked to a line across a river being switched off to allow a ship to pass through safely, Reuters reported. France was one of the worst affected, with five million losing power mainly in the east of the country and the capital, Paris, and its suburbs. Most electricity supplies were restored within two hours of the outage, and so far no injuries or accidents have been reported. 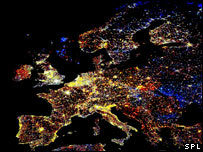 The worst recent power blackout struck Italy in 2003, plunging the country into darkness for 18 hours between 28 and 29 September.